The Éist section is primarily about looking, listening and responding to questions. All Éist E-books are graded by Rang but you as the teacher will be in the best position to choose the grade most suitable for your class. 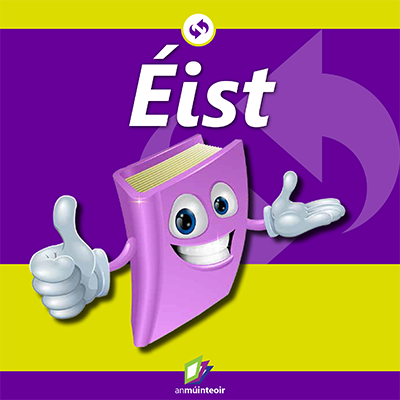 In Éisteacht the class will listen to a short comhrá and then respond to three ceisteanna. The comhrá content is always displayed on the previous page and these conversations are recorded in the three canúintí. Éisteacht is very closely linked to Comhrá, Léitheoireacht and Scríobhneoireacht. Buíoch le Ailbhe, Clodagh agus a máthair Suzanne ó Dhún na nGall a rinne an taifeadadh. The comhrá content is always displayed on the previous page. Zoom in on the éist button and the class will not see the questions on the opposite page. Zoom out again to see the ceisteanna.